How to wear a kilt is a subject that many of you would like some further information on. Indeed for anyone who has never worn one before, it can be quite confusing, as there are so many accessories that go with the kilt. To put your kilt on, you first take the under apron from right to left passing the strap through the hole, and then fasten it to the buckle on the left hand side. The top apron is then taken from left to right, and is also fastened with the strap and buckle. You then ensure that both aprons are aligned at the top, also ensuring that the kilt is properly centered. I would point out at this stage, that the aprons are always worn at the front, with the pleats therefor at the back. Now although I know that almost all of you are aware of this, I have a photo below of none other than Richard Branson the owner of Virgin Airlines, wearing a kilt with the pleats at the front. The kilt is worn at the natural waist, with the top of the apron just above your navel, and should come to the middle of your knee. I would strongly recommend that you have your kilt made by a master kilt maker, who will measure you to ensure a perfect fit. If you are considering ordering a kilt online, then do make sure that you follow the measuring instructions to the letter. So how do you wear your kilt? 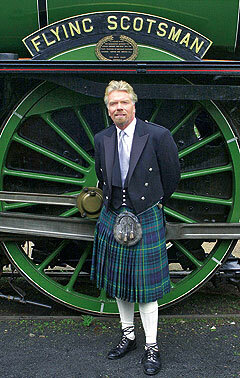 I am sure you know how to wear your kilt, unlike the misinformed Mr Branson above. Would you care to share with other visitors to this website, how and when you wear your kilt? How about writing a page for the site using the form below, and please include some photos. I and your fellow visitors to this site, look forward to reading about your kilt wearing experiences. You need to decide if you want your kilt for day or evening wear, or indeed both. If you want it for day wear but still rather formal, then you would accessorize your kilt with a tweed jacket, this is often referred to as an Argyll outfit. If the occasion is less than formal, a Jacobite shirt is often worn with the kilt giving it a stylish yet casual look. For weddings, gala dinners or any other formal occasion you can think of, the Prince Charlie Jacket worn with the kilt is the ultimate evening wear. If you have any other questions regarding how to wear a kilt, or indeed anything else to do with the kilt or its accessories, please drop me a line using the Contact Us page.